Boro-Horse – meant to be! 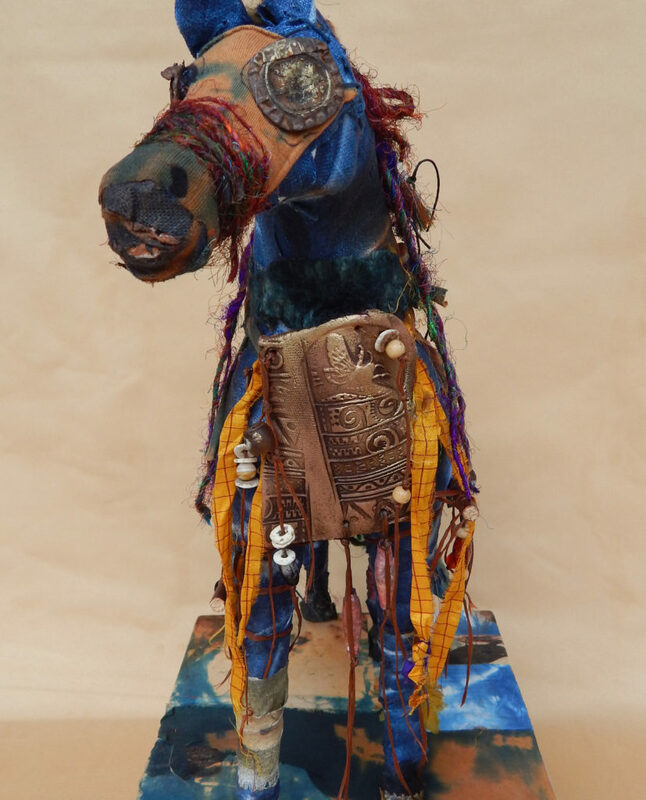 This magical horse insisted on being created while I was in the middle of getting another piece ready for the Fiber Artists juried show. 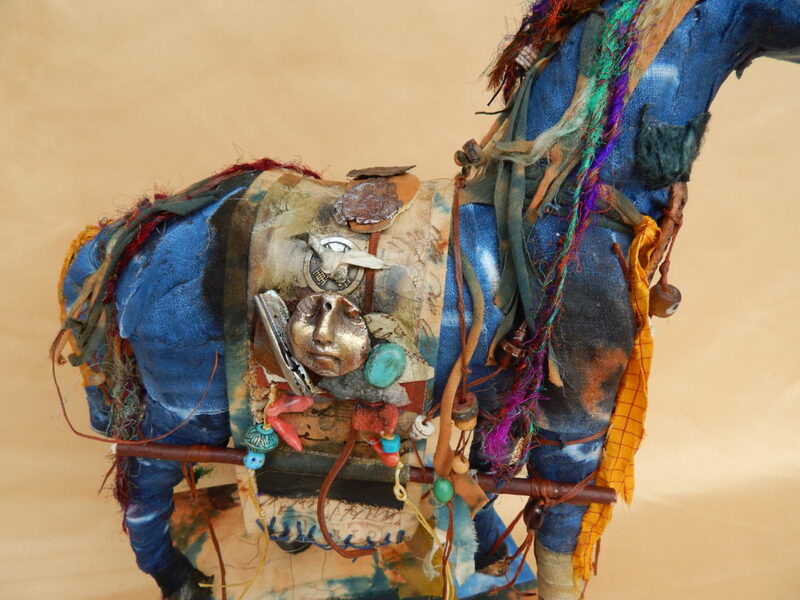 I had some scraps of indigo linen on the table when I spied a beat-up papier-mache horse figure that had come from my old studio and was much the worse for wear, with one leg broken. On impulse, I wrapped the strip of indigo linen around his broken leg — he liked it! 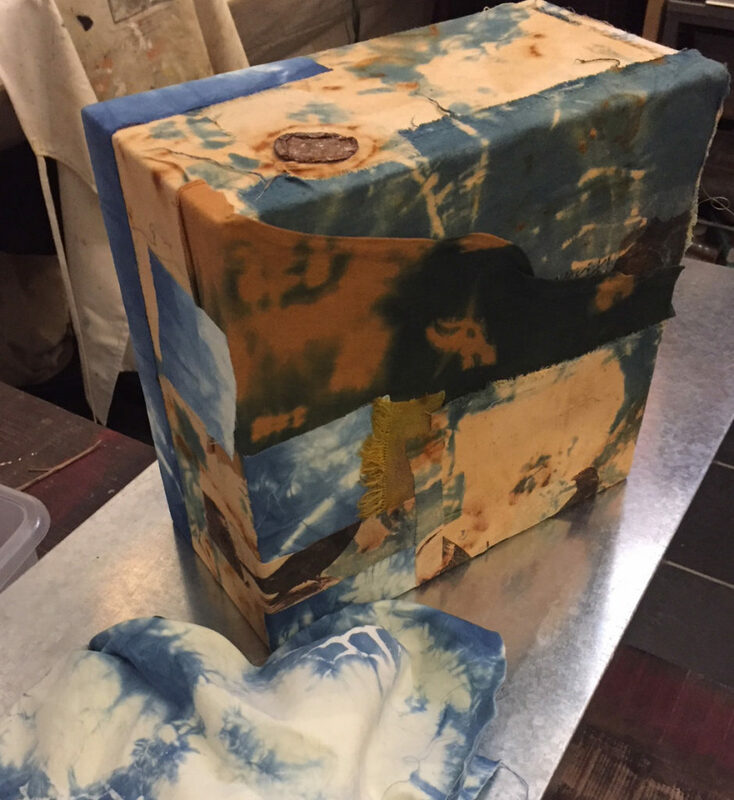 So I kept going, patching in the tradition of the Boro textiles of old Japan. 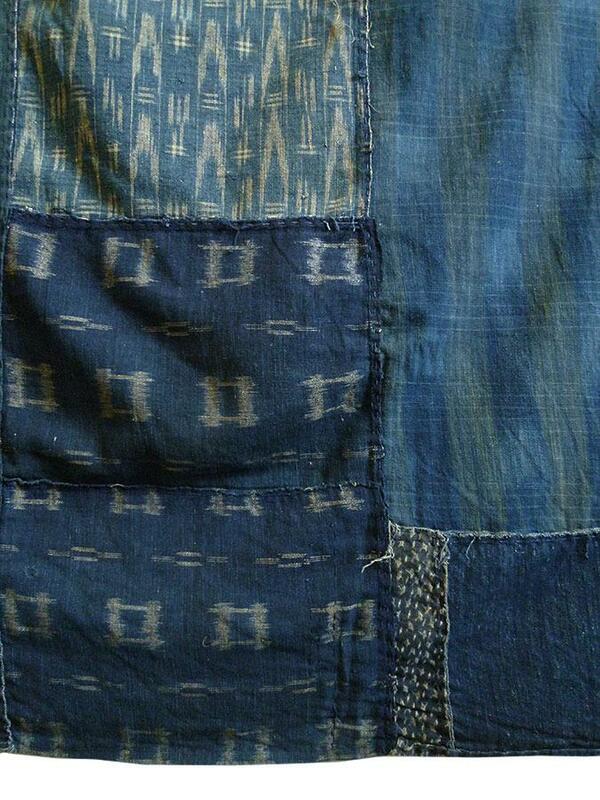 Boro textiles are usually sewn from nineteenth and early twentieth century rags and patches of indigo dyed cotton. 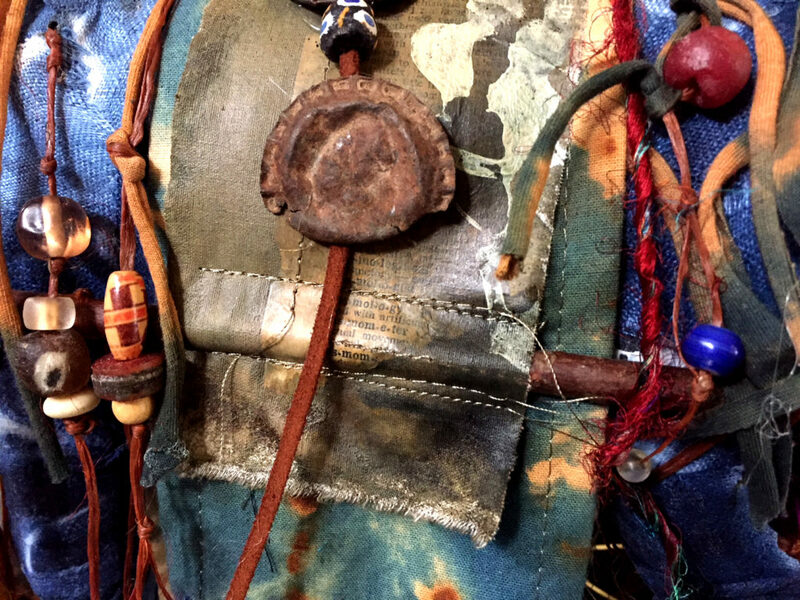 The diversity of patches on any given piece is a veritable encyclopedia of hand loomed cotton indigo from historic Japan. 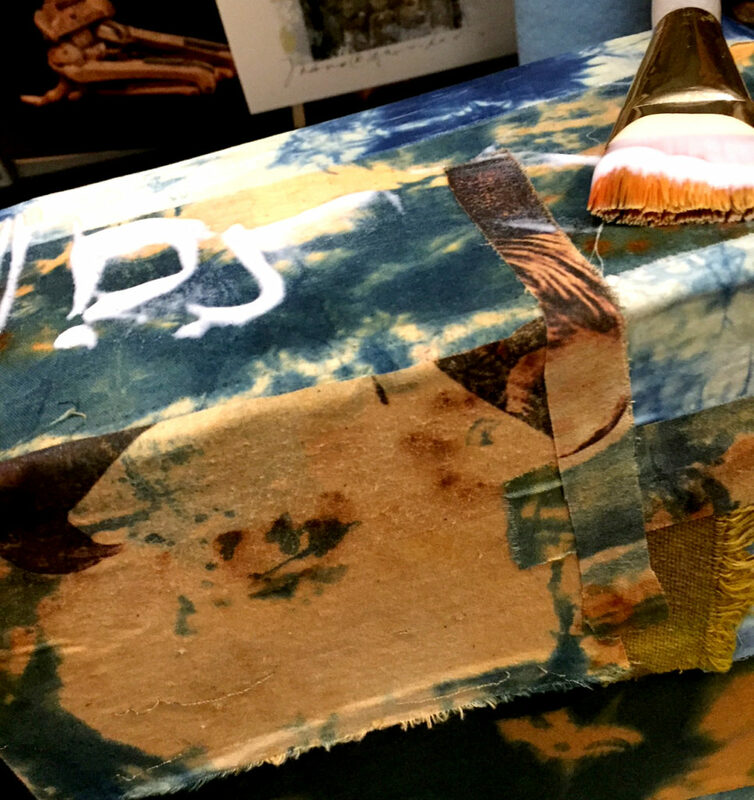 Once he was covered with indigo scraps, Boro-style, I began adding strips of sari ribbon. I sewed a saddle-blanket for him and added sticks and beads and fund objects. This weekend, I decided that Boro-Horse needed a stand to elevate him to his proper status as a very cool animal. I used more scraps from old indigo and rust projects to cover his platform, the sealed it all with acrylic matte medium. Boro-Horse will have little Velcro dots on the bottom of his hooves and matching ones on the stand so he will be able to be secured but still be removable. With his stand, he’s about 24″ high. He’ll be one of my entries in the San Antonio Fiber Arts Juried Show. I encourage all of you to enter as well. If you work in fiber of any kind (including paper, which is a fiber), you are eligible to enter your artwork in the upcoming 44th Annual Juried Fiber Art Exhibit!! When and Where: Say Si Art Gallery, located at 1518 S. Alamo St., San Antonio, TX 78204. Art will hang December 7, 2018 to January 25, 2019. You might just see Boro-Horse there!! 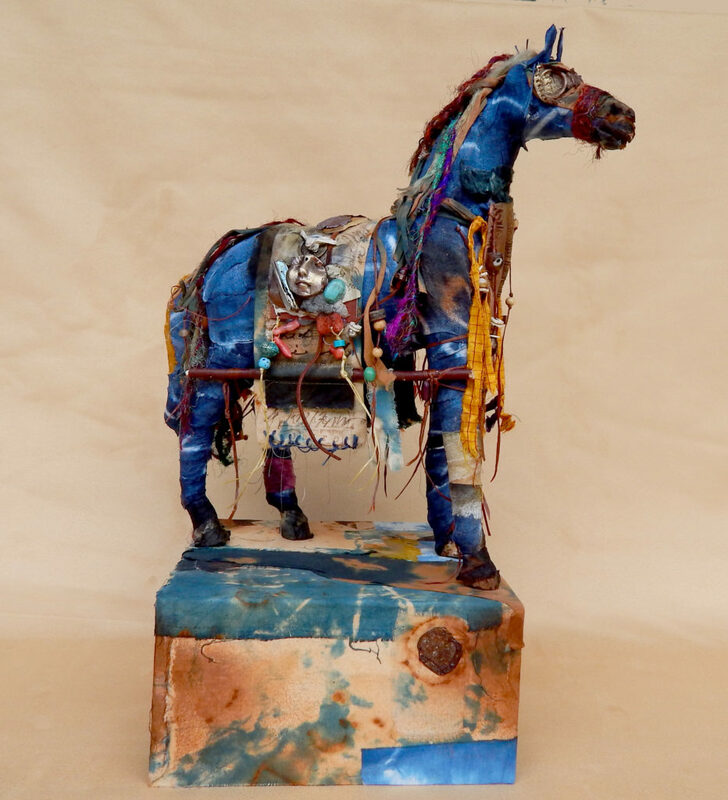 This entry was posted in Assemblage, found objects, Mixed Media and tagged Boro, Fobr Art, horse, rust and indigo, textiles by lynbelisle. Bookmark the permalink. Lyn. He really is magnificent! Look forward to seeing him!! Lyn, your magical horse is just that — magical! He’s gorgeous. He is so awesome! You have such wonderful creativity! Creative resurrections are so needed in this world and the one you’ve brought back to life was definitely meant to be – to stand – so majestic in humble boro trappings. Wow…I love how he turned out! Your Magical Horse is very inspiring and inspired. Love it! I love him! So like you to attend his injuries and .ame him beautiful! Hugs! Lyn, he is stunning. I really love horses and this does them justice and then some. Spectacular!!! And still soooo YOU!!!! i remember that horse! great work! What a beautiful remake! I love it. You are so creative!. Can’t wait to see him up close. Beautiful and echo that is simply magical!